The March 5, 1945, issue of Life Magazine (pp 25-29) ran a story titled " Santo Tomas is Delivered". On page 26, there is a photo of Ernest Stanley, a missionary who worked as an interpreter during the talks between American Colonel Brady and the Japanese Lt. Col. Toshio Hayashi to negotiate a release of the civilian prisoners. 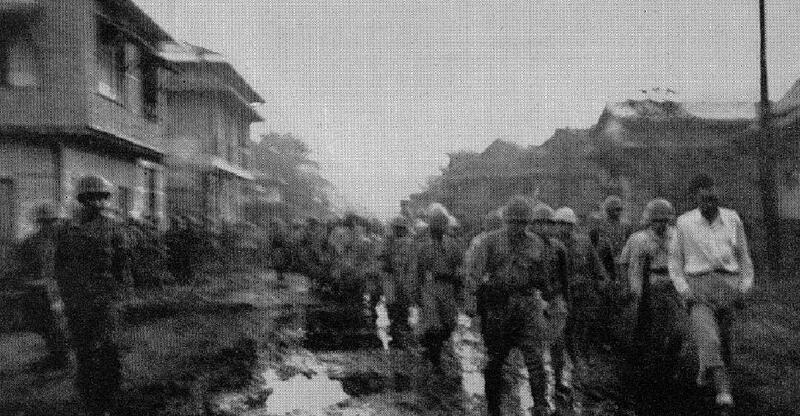 There are also some photos of Ernest Stanley leading the Japanese soldiers out of the Santo Tomas grounds in a book called "the First Cavalry Division in World War II" by Major B.C. Wright, Division Historian. It took 35 hours to negotiate a deal. Apparently the deal struck allowed the Japanese to walk to their own lines. They were allowed to only carry their rifles, pistols and swords. 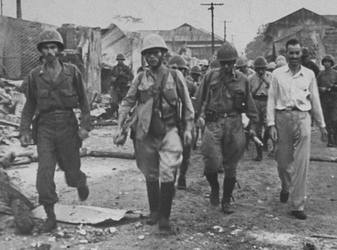 Stanley was pictured leading a group of 63 fully armed Japanese soldiers away from Santo Tomas internment camp in the Philippines after holding their hostages for 36 hours (February 5, 1945). The camp had been liberated previously by advancing American forces, but over 200 of the civilian prisoners were taken hostage by desperate Japanese guards in a hope to secure their survival. The hostages were in great danger. The Americans had asked the Japanese to surrender but Lt. Colonel Hayashi answered, "It is not compatible with Japanese military doctrine." Thanks to Ernest Stanley who in the course of negotiatations (walked unarmed across "No Man's Land") managed to get the civilian prisoners released unharmed. It was reported that the Japanese guards however, did not fare so well as they were later ambushed by local Filipinos who were enraged by their brutality. Several of the Japanese soldiers were killed including Hayashi. Later in the afternoon, some of the same group returned to Santo Tomas They were captured and taken prisoner that same day. If true, it is unlikely that Stanley was a party to this act as he was a peace loving man that was caught up in the destruction of war. According to the Lt. Col. Walter J. Landry letter the above mentioned ambush was reported by "rumor mongers" and is "without foundation". 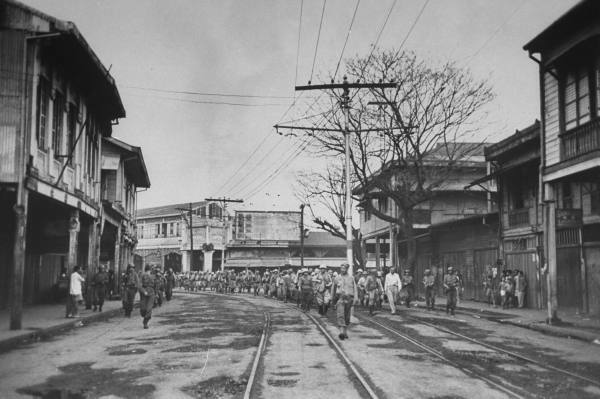 Pictures showing Ernest Stanley in white shirt, leading the 63 Japanese soldiers across "no mans land" Manila, Luzon, Philippines. Some people say that Stanley can be seen in the photos of the signing of the surrender of Japan on the battleship USS Missouri on September 2, 1945, still acting in his position of interpreter, but that has not been verified by this website administrator. Several photos have been studied for Ernest Stanley's semblance. After his release from Santo Tomas ERNEST STANLEY went to Japan with the American Army as an interpreter. He continued in the ministry at least until 1948. He married a Japanese lady and took up residence in Tokyo, Japan and later adopted a son. He lived in Tokyo the rest of his life. His home seemed to be the center of activities for his churches work in Japan until his death in Tokyo in 1990. He was credited with being very helpful to the American civilian POWs. Reportedly, his loyalty was questioned after the war by officials, but he was completely exonerated and praised. Many fellow inmates considered him to be a collaborator, "It was a view reinforced by the special treatment he recieved, being allowed to live on his own, away from the main body of internees." Stanley appears in Clio Mathews Wetmore's book entitled "Beyond Pearl Harbor" (1998) as one of the unsung heroes of Santo Tomas Based on information that Clio received, Clio cites Stanley as a British agent responsible for tipping off MacArthur as to Japanese plans to murder thousands of male prisoners February 4, 1945, and retreat from Manila with the women and children as hostages. Another book titled "In the Enemy's Camp " by Suzanne Sparrow Watson, Kathleen Chapman Watson relays some of the same information on page 78. The book goes on to say that Stanley was the most hated person in the camp and he even ate and slept with the Japanese. 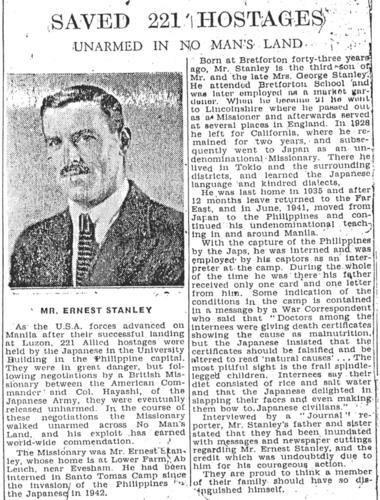 But the tone of Beaber's, Jamieson's, Stancliff's and Barrett's numerous references to fellow-missionary Stanley during the days and weeks before the war cast considerable doubt on these conclusion that Stanley was a British secret agent planted by British Intelligence long before the war. He was just a peaceful religious man who could speak the Japanese language and was used by the Japanese as an interpreter. According to one source it was reported that the room where Ernest lived in the camp he shared with "eight" Americans; he was the only Britisher. Stanley himself said this at a church service at Evanston, Illinois - Wednesday Night on January 21, 1948. It will be interesting to see how history treats the Stanley story in the years ahead. Ernest was given Japanese citizenship before he died--something that rarely is given to an alien. 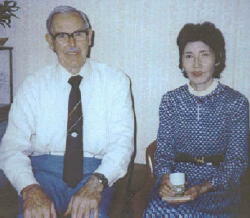 The following is a picture of Ernest Stanley and his wife. It was taken about 1982 in Tokyo, Japan. On Feb 12, 1942 there were three men who had escaped from Santo Tomas. They had jumped the wall to catch a boat and sail to Australia. Unfortunately, they were caught. The three men were Blakely Borthwick Laycock age 25 - Henry Edward Weeks age 28 and Thomas Henry Fletcher age 29. At 11 am on Sunday Feb 15th they were tried by military court martial and sentenced to death, because the penalty for escape was death by shooting. The Japanese Commandant and other officers read the sentencing according to Japanese Military Law. The Santo Tomas Executive Committee... Earl Carrol, Chairman of the Committee, CE Stewart, RH Pedder and a British clergyman Rev. Griffiths, together with interpreter, Ernest Stanley had been ordered to the Manila South Police Station where the prisoners were held. On behalf of the prisoners, they begged to no avail for reconsideration of such a sentence. After the sentence was ordered the Reverend spoke to the men and they were escorted to the Manila North Cemetery with the entourage, to the awaiting graves dug by Japanese soldiers. They were blind folded and made to sit at the edge of the graves with their legs dangling. Several Japanese soldiers with guns stood about fifteen feet from the men and they shot each man until they fell in the grave and they continued shooting them while in the grave. The witnesses counted 13 shots. The Reverend then read a burial prayer while the Japanese soldiers stood in salute. Groans still were coming from that grave when the Japs began to shovel dirt into it. Several Japanese guards then layed sprays of bougainvillea on the graves and they walked away. Click bookcover to order book.